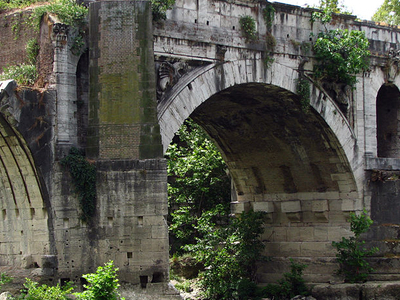 The Pons Aemilius (Italian: Ponte Emilio), today called Ponte Rotto, is the oldest Roman stone bridge in Rome, Italy. Preceded by a wooden version, it was rebuilt in stone in the 2nd century BC. It once spanned the Tiber, connecting the Forum Boarium with Trastevere; a single arch in mid-river is all that remains today, lending the bridge its name Ponte Rotto ("Broken bridge"). Here's the our members favorite photos of "Ruins in Rome". Upload your photo of Pons Aemilius!